Zawadi self-catering roundhouse in one of the two kenya-style roundhouses. The roundhouses Azizi and Zawadi are perfect for couples. 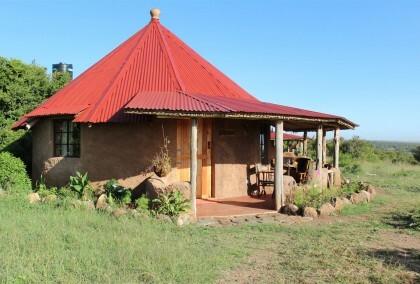 Azizi self-catering roundhouse in one of the two kenya-style Roundhouse. The roudhouses Azizi and Zawadi are perfect for couples. Small and Cosy roundhouses next to the Aderdares – Azizi and Zawadi are the perfect self-catering roundhouses for couples and a perfect weekend getaway for couples. The small and cosy roundhouses are situated on Sandai Farm and are two Kenyan roundhouses next to each other with a kitchen in between. Azizi and Zawadi both consist of 1 bedrooms with a double bed. The gallery overlooking the lower bedroom can be equipped with an extra mattress. 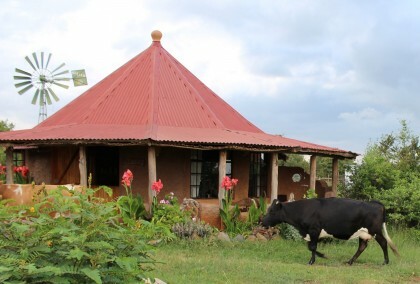 Our Kenyan-style roundhouses next to the Aderdares are perfect for families with children or two couples who want to spend time together and yet enjoy the luxury of private rooms.